To begin again by stating the obvious: you can’t eat art but artists have to eat. And so from early times, the hunters and gatherers of this world have shown a great degree of largesse towards artists. But in recent decades, that same largesse has become a focus for the visual arts. Since Rirkrit Tiravanija cooked up Thai curry at 303 gallery in New York, it is no longer uncommon to be fed. And one imagines that within the field of social practice, there is more need to be useful than to startle the world with a brand new idea. There are few new ideas in basic survival. 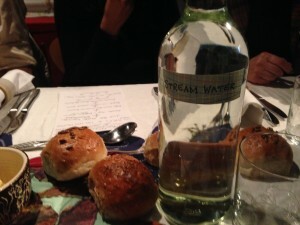 There is a basic element in The Village Table: good food, locally sourced, together with water from a stream. Given the amount of wine that sloshes around PVs, the stream water seemed important. But beyond that functional appearance, the five-course menu in Luton was exotic with Japanese dishes mixed with English pickles and mitteleuropean Sauerkraut. Cabbages are in season. And in terms of table dressing, the Village Table also deviated from pure function: black clay pickle jars made by Bedwyr Williams, a table set by Laure Provost, plates by Mark Essen. An immense amount of work, in both studio and kitchen, comes together for these events. And since they travel from the Lake District home of Grizedale Arts, they are a movable feast (sorry). It seemed important we were in Luton. Invitations came via Dominic from Luton, the artist who, along with 33 Arts, instigated the event and gathered the fortunate attendees. And, in an unplanned gesture that took us from the sublime to the absurd, after the Kimchee soup and the Damson Membrillo, Dominic passed out a few Ferrero Rocher chocolates. This brand, which became a byword for aspirational luxury in the 1990s, must have represented one of the few ingredients at this banquet, actually sourced in our post-industrial setting. One could say more about this, because it was an evening where the North met the far East in the most maligned of small UK towns. The Village Table is a great leveller that way. The Village Table is conceived and run by Grizedale Arts in Coniston, Cumbria. An event at The Hat Factory in Luton took place on 19 February 2016, organised by Dominic from Luton, aka Sunridge Avenue Projects, and local arts organisation 33 Arts.